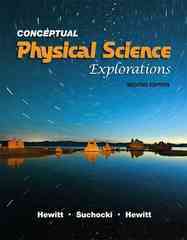 Conceptual Physical Science Explorations 2 Edition Focused on the idea that the rules of the physical world can be taught using a conceptual approach that emphasizes qualitative analysis, the Hewitt team has created a book that is highly readable, flexible, and hands-on. Thirty-four concisely written chapters allow you to better select topics to match your course and the needs of your readers in a one- or two- semester course. Conceptual Physical Science Explorations, Second Edition presents a clear and engaging introduction to physics, chemistry, astronomy, and earth sciences. The authors use analogies and everyday examples to clarify key concepts and help readers better understand the world around them. The book's consistent, high-quality coverage stimulates active learning with critical thinking exercises, hands-on experiments, review questions, and quantitative problems. Conceptual Physical Science Explorations is less rigorous in coverage and written more simply than Conceptual Physical Science, Fourth Edition, and directed primarily to college courses where readers are less well prepared, and in some cases, remedial. The Second Edition features updated content, new Chapter Opening statements, and more. About Science, Newton’s First Law of Motion - Inertia, Newton’s Second Law of Motion - Force and Acceleration, Newton’s Third Law of Motion - Action and Reaction, Momentum, Energy, Gravity, Fluid Mechanics, Heat, Electricity, Magnetism, Waves and Sound, Light and Color, Properties of Light, The Atom, Nuclear Energy, Elements of Chemistry, How Atoms Bond and Molecules Attract, How Chemicals Mix, How Chemicals React, Two Types of Chemical Reactions, Organic Compounds, The Chemistry of Drugs, Nutrition, Rocks and Minerals, Earth’s Interior, Plate Tectonics, Earth’s Surface Features, Earth History Over Time, Oceans and Atmosphere, Driving Forces of Weather, The Solar System, Stars and Galaxies, The Structure of Space and Time. Intended for those interested in learning the basics of conceptual physical science.